Diameter - 1/8", 3/16", 1/4"
Sheath Mat'l - std. 316 St. Stl. Termination - bare ends, TEFLON, fiberglass and armored lead wires. Most widely specified for general use in all industries. Usually immersed into air or liquid and secured with a compression fitting. Termination is according to the requirements of the application. Fitting Material - 316 St. Stl. Single ended or double ended fittings welded to sheath offers secure water tight connection. 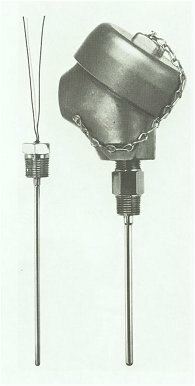 Double ended and single fitting facing lead wires are used with connection heads. The single fitting facing the measureing junction is for direct mounting into process.